Blooms Winery & 5511 Bistro- experience fine wines & fabulous cuisine! Our new Winery, Tasting Room & Bistro is completed and we are open for business! This is an exciting step for us, after nearly a decade at the Bayview Corner we have our winery and tasting room (tastings from 11-5) in the same location! 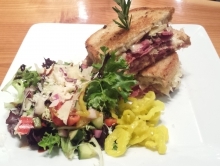 We offer lunch and dinner Thursdays through Monday from our restaurant – the 5511 Bistro (open until 8 pm). Enjoy live music every Friday night 6-8 and Sunday afternoons 4-6 and an Open Mic Night the 2nd Thursday of the month. Enjoy the artwork of many local artists – paintings, glass, woodwork, fabric art, jewelry, weaving and more! 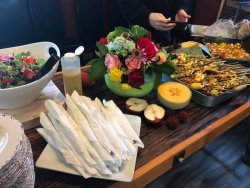 We have ample seating and offer banquet capabilities with wonderful outdoor spaces and lots more room for enjoying fine hand-crafted Wine, Art & Music and fabulous Cuisine by executive chef Wayne Carter! Wine, Art, Food & Music make a great blend at Blooms! 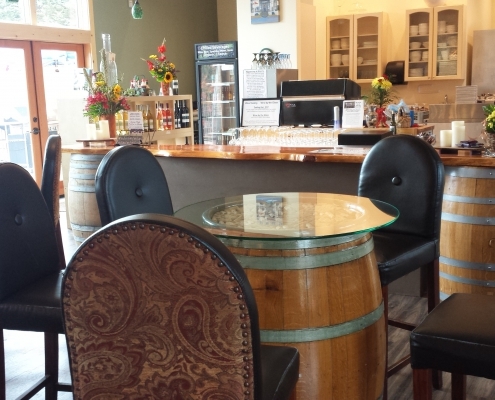 Blooms Winery & 5511 Bistro is open Thursday through Monday at 5511 Freeland Ave, Freeland. 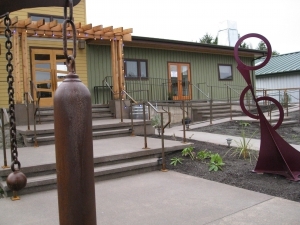 It is home to the winery, tasting room, and bistro with both indoor and outdoor spaces and banquet facility options. Our executive chef, Wayne Carter, has created a wonderful menu to offer for lunch and dinner with lots of wonderful specials daily. Fresh soups, salads, and fun entrees like prawn tacos and lamb sliders are part of the lunch menu, and dinner offers great options for hearty eaters with a Butchers Block meat special, Pasta of the Day and the same great soups, salads and lighter entrees for those who prefer. We are booking events like club meetings and lunches, non profit events and business parties. Give us a call at 360-321-0515. Whidbey Life Magazine features an article about “Rhubarb” and includes our Blooms Winery Ambrosia in the article along with a photo! Our 2015 Petit Verdot was given a 95 Pt. rating and a Double Gold Medal at the Savor Northwest Wine Competition 2018. With other varieties we received two Silvers and a Bronze at Seattle Wine Awards 2018. The Spring 2017 issue of Wine Press Northwest has a feature on Malbec, and Blooms 2013 (the current release) was given a “Recommended” rating, and the upcoming 2014 (ETA summer 2018) was given an “Excellent” rating! 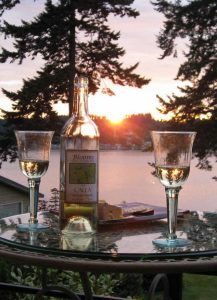 Northwest Wine Nights Radio interviewed Ken and Virginia Bloom about the winery and here is the link to the live show! They also did a Syrah tasting with the Double Gold Medal 2012 Syrah on the live TV show with a panel of wine experts – SEE TV Episode Here! Q-13 Fox News came to Blooms Winery to talk about wines made on Whidbey and participated in bottling the 2013 Riesling. See the video of the fun we had with Kaci Atchison Here. With the recent snow event we are sending staff home to be safe and closing early. Sorry for the inconvenience! For the Red Wine & Chocolate Tour – weekends have been extended to March 3rd and your tickets will be honored until then. Stay warm, stay safe, we hope to see you soon! 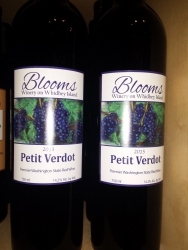 Blooms fine wines are also available at local wine shops, grocery stores, wine bars and restaurants on Whidbey Island. On Friday September 28th 2018 we opened in our new location at 5511 Freeland Ave. Phone # remains the same – 360-321-0515. We’re open for lunch and dinner, options may be limited from 3-5 while we switch from lunch to dinner service! Great fresh salads like our 5511 Salad that includes organic mixed greens, a Napa cabbage jicama slaw, dried & fresh fruit, pumpkin seeds, nuts and mango salsa with a housemade passionfruit vinaigrette; Mediterranean Salad with organic mixed greens, heirloom tomato & cucumber chutney, shaved Italian cheeses, Israeli couscous and a house balsamic dressing; or our special Fall Harvest Salad that includes organic greens, herbed goat cheese, dried apricots & cherries, nuts and seeds, our house made apple cranberry chutney and a housemade cherry cider vinaigrette. Looking for a place to stay on Whidbey? On the waterfront of Holmes Harbor, the Blooms Winery Suite is a one bedroom suite located above what used to be our winery (before we outgrew our space). It is available as a vacation rental by the day or week. Call us or visit Vacasa for reservation info.